SINGAPORE — Divers have recovered the remains of all 10 sailors who went missing after the USS John S. McCain and an oil tanker collided near Singapore last week, the U.S. Navy said Monday. 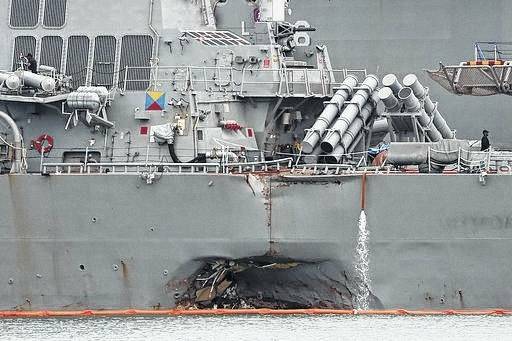 The crash ripped a gash in the McCain’s hull, flooding crew berths and machinery and communications rooms. The commander of the Navy’s Japan-based 7th Fleet was fired last week after a series of accidents this year raised questions about its operations. The firing of Vice Adm. Joseph Aucoin, a three-star admiral, was a rare dismissal of a high-ranking officer for operational reasons. The damaged port aft hull of the USS John S. McCain is visible while docked at Singapore’s Changi naval base in Singapore, in this Aug. 22, 2017 file photo. Divers have recovered the remains of all 10 sailors who went missing after the USS John S. McCain and an oil tanker collided near Singapore last week, the U.S. Navy said Monday.